Bremen Quedlinburg Wernigerode Leipzig Dresden Meissen Bavaria /Mittenw. 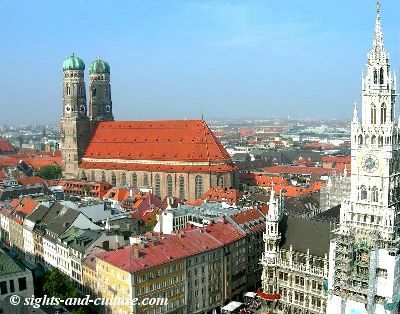 The 1,3 million city of Munich is the capital of Bavaria and its economic and cultural centre. 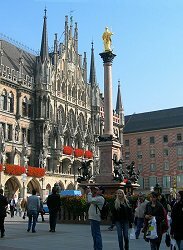 First mentioned in a document in 1158, Munich was granted city status in 1175. It is supposed that the city at the Isar river possibly originates from a settlement of Benedictine monks in the 8th century at the Petersbergl, today’s location of the church of St.Peter. Three gates still bear witness to the mediaeval fortification - Isar Gate (Isartor), the Sendlinger Gate (Sendlinger Tor) and the reconstructed Karl’s Gate (Karlstor). The core of the historic Old Town and the oldest square is Mary’s Square (Marienplatz), a beautiful place with a Marian column in its centre, which is surrounded by interesting historic buildings and cultural monuments, such as the Old and New Town Halls in gothic style with the famous chime at the new hall, the nearby mediaeval church of St.Peter and the cathedral of Our Lady (Frauenkirche). The 99 metre (325 feet) high twin towers of the cathedral are the landmark of the city and give, together with the 92 metre (302 feet) high tower of St.Peter and the 85 metre high steeple of the New Town Hall, spectacular views over the city. Also, Ludwig I enriched Munich with magnificent neoclassical buildings, such as those at the Royal Square (Koenigsplatz) and the Royal Ludwig Avenue (Ludwigstrasse). Of course there is much more to be seen in this grand city. A must are among others the three Pinakotheks as well as the German Museum, the world’s largest museum of technology and science, with approximately 1.3 million visitors per year and about 28,000 exhibited objects from 50 fields. Munich became famous also through its car industry (BMW) and the Festival of Beer, the Oktoberfest, which takes place every year in October at the “Wiesn” (Theresienwiesen). It has a long tradition, the origins of which go back to 1810, when it was part of royal wedding celebrations. As the Bavarians maintain, it became the world’s biggest public festival. May be they did not count the grandiose festivals in India and China. However, it was reported that in 2007, during the 16 days of beer, fun and Gemutlichkeit (cosiness) 6,.2 million people from all over the world consumed approximately 6.7 million “Masss” (stein) of beer, thousands of “Hendl” (chickens) and 104 oxen. 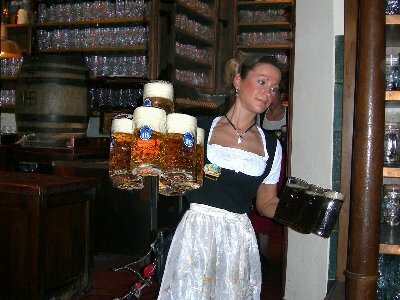 The prices for beer have been comparatively high – one litre costs around € 9,80 However, Bavarian beer is very good and tasty. A special tourist spot in this connection is the “Hofbraeuhaus” in the inner city, one of the most famous beer halls. There is a very special rustic atmosphere; a typical Bavarian brass band, (the players dressed in short, leather trousers), plays and people sing and laugh loud, enjoying their “Mass” beer. By the way, the meals there are tasty and of good value.